Now that Winter has finally left and we're in the middle of Spring, it's time to break out the flip flops, sun dresses, pedicures and make sure our hair is looking good. As a mom, I'm constantly using not only my flat iron every morning to make sure my hair looks decent, but I'm also always using my hair dryer along with my hot comb to make sure it's as straight and flat as it can get. This is not only a lot of heat on my hair, but it also causes a lot of damage as well. Not to mention that every once in a while I like dying and putting a relaxer on my hair too. With all the different heat and chemicals, no wonder the ends of my hair sometimes look a bit rough. That's why I was pretty excited when I got the opportunity to try Garnier’s latest hair care innovation from the new Fructis Damage Eraser line. It's designed to help us ladies who use a hair straightener, blow dryer or other heat styling tools on a daily basis so that we don't have to give up on our favorite look. The Fructis Damage Eraser line reconstructs hair strength by 90% from the root of your hair to the tips so that we can still use our styling tools without worrying about our hair getting damaged. I have to say I was pretty impressed with the line. I got to try the shampoo, conditioner and Strength Reconstructing Butter and the first thing I noticed was that each of the three products smelled absolutely delicious. I love when the hair products I use have a great smell. Another thing I noticed after using was how soft my hair felt after blow drying and how shiny it looked after I was done using my flat iron. Since going to the beauty salon as a busy mom isn't always an option, I love that I've found a product that not only helps strengthens and reconstructs my hair, but also makes me look and feel good as well. You get the salon look and treatment without the salon price. 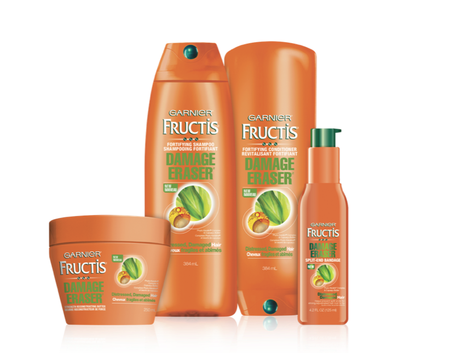 Be sure to visit the Garnier website to learn more about the NEW Fructis Damage Eraser hair line and to take advantage of their limited time trial offers.